You know how when a new baby arrives, everyone tries to decide who the baby looks like? There end up being a lot of discussions that include things like “oh, that’s her mom’s mouth”, “he has his dad’s eyes”, etc., etc. Sean always likes to interject something along the lines of “You know what? She looks like both of them! It’s amazing! It’s like they’re her parents!”. Anyway, of course this has happened with our little ones as well, and continues to be a frequent topic with family and friends. I have always seen a strong, strong resemblance to Sean in Maggie, but we frequently hear how much she looks like me. This has also happened in reverse with Calvin – he is a carbon copy of my dad at his age, but we always hear how he looks just like Sean. I’m guessing that this has a lot to do just with the fact that Maggie and I are girls and Calvin and Sean are boys. Hallie is still up in the air – the consensus is split between her being identical to Maggie or Calvin. 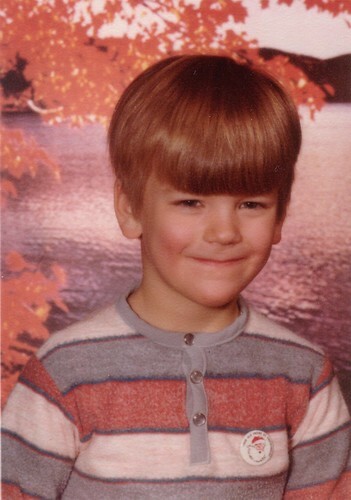 That’s Sean’s Kindergarten school picture. Look how cute he is! 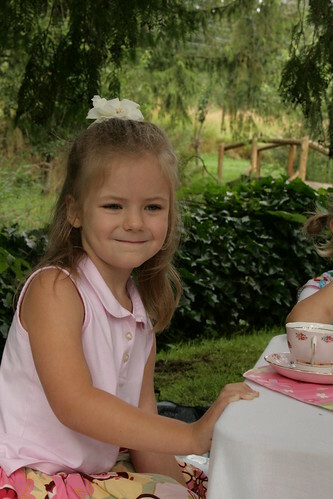 Anyway, I am very thankful that our girl can look so much like her dad and still be a beautiful little lady as well. Haha! Lydia showed me that photo a few days ago and asked me who it looked like. In my mind I was thinking, “Whoa it looks like Maggie, but it’s obviously not Maggie, maybe a cousin or something?” Then, never wanting to openly be a fool, I slyly asked who’s it SUPPOSED to look like? I was totally shocked when she told me how the photo was made! It looks so much like a real little girl! Wow! Outrageous! Who would have thought that a dad and daughter could look so much alike. And yes, they are both gorgeous and both take (or have taken) advantage of the dimples. Thanks for the new Halle photos, too. After nearly killing my computer last Friday, I am glad to be able to view ALL the grandkid photos again! The spelling of Hallie’s name was a misprint in my last comment. Sorry! oh I totally thought the new baby looked like you – she has that smirk you have on her face! HA!! #1: That is incredible. I didn’t even realize until I looked at the full picture of Sean. I can hardly believe how much she looks like him! #2: How are you doing? Congratulations on the new baby! How is Hallie? What’s the latest up in WA? #3: It’s beginning to feel a little like WA here at night now. But in the daytime, it’s still good ol’ SoCal. Thought you might like to know.